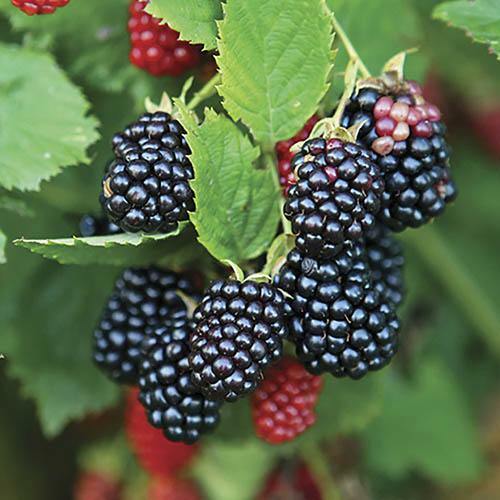 Pick juicy Blackberry fruits in your own garden - without the brambles! 'Chester' produces abundant crops from August to the first frosts. 'Chester' in a thornless variety - no thorns in your way when picking! Perfect for conditions in the UK, and its pretty foliage and berries will add a decorative look to patio pots and borders. Supplied as a pair of 2 year old, 20-30cm tall plants in 1 litre pots. Pick juicy Blackberry fruits in your own garden - without the brambles! Perfect. 'Chester' produces abundant crops of large, firm berries that are simply bursting with gorgeous sweet juice! You'll be able to reliably pick the wonderful fruits from August to the first frosts each year, and best of all, there are no thorns in your way. This US bred beauty is perfect for conditions in the UK, and its pretty foliage and berries will add a decorative look to patio pots and borders.